The up and under in rugby is mainly a medium length kick to apply pressure to the opposition. You aim for great height so you and/or your chasers can be there when it lands. Aim to handle well and know your rugby kicking basics. You use this kick mostly to get out of difficult defensive situations and/or where you are somewhat isolated. Example: you have caught a high ball outside the 22 metre line, have few or no options to pass and are faced by a number opposition players chasing the ball. You use it less frequently in attacking situations and usually when other options are reduced or non-existent. Using this kick provides you with the potential to make ground rapidly and put the defense under pressure. You kick the ball to a great height and when it descends from the clouds it`s difficult for defenders to catch. This is especially true when you and your team mates are racing in to tackle! You may also create chaos if the ball bounces, shooting off unpredictably and possibly being mishandled by players. You may notice some similarities between this kick and the spiral punt. Knowing one means you know a lot about the other. Hold the ball lengthways across your chest, level with the ground. Fingertips and thumb of the top hand each along a seam. Fingertips/thumbtip of your other hand support underneath the ball. Lift it to just above shoulder height and remove your hand from beneath the ball. It's now at arms length, in perfect position for kicking. 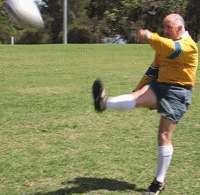 As you position the ball you take a step with your non-kicking leg . Guide the ball downwards to meet your foot as you take the step forward and bring your foot through to strike the ball. Avoid pointing your toes. Keep your toes pulled back, forming a 'U'-shaped bend at your ankle. As your leg comes through, aim to kick the ball with the bony mass of the top of your foot. In the follow through ending to the kick, have a near 90 degree angle at your ankle, toes pulled back towards you. Kick in a straight towards your target. Kick right through the ball	for maximum height. Choose a straight line on the field and kick along it. Decide before you kick how far you want the ball to travel. Seeing where the ball lands in relation to the palce on the line you were aiming for will help you improve rapidly. First, aim to be accurate. Distance will improve over time. 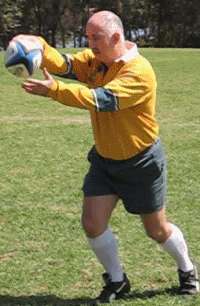 The box kick is used mainly by the scrum half. You use it infrequently, but you want a complete set of kicks, don`t you? If you`re a winger, tell your scrum half about this one! You use it more often after a scrum, sometimes after a lineout. Sometimes used by design, sometimes simply to get out of trouble. The area is sparsely defended and if the opposition is not paying attention they can be vulnerable. Many players will be offside when the kick is made.They must not advance or take part in play until put onside. If they are within 10 metres of where the ball is going to land, they must run back towards their own goal-line until far enough away. The player most likely to take advantage of this kick having been made, is the winger closest to you, the kicker. They would usually be in an onside position (behind the kicker), in a position to see what is happening and fast enough to take advantage of the situation. You give the ball height to give chasers enough time to get to the ball with a chance to retrieve it or tackle anyone who catches it. There are only small differences between the two kicks. The main difference is that you don`t give the box kick as much height. You`re attacking rather than trying to get out of trouble. It`s a surprise. You want just enough time for your player to get there and as little time as possible for defenders to respond. If this is the case you must simply adjust the direction of the kick to take your position into account. If you are facing sideways, you have to direct your kick sideways so you make it travel in the right direction - forwards, towards their goal-line. Same goes for facing backwards. You simply make sure you strike the ball when your foot is very high in the air. You can reduce the height you have to lift your leg by leaning backwards as you kick. This will take the ball back over your head, into the box. Finding out about all the different kicks will help you understand the game and help you master the positions that are best for you. Know how you do them or know when to expect them so you will be ready.